Cool Science and Technology Experiments! All right, I'll admit I'm more than a wee bit biased here. I am, after all, a science teacher. I feel that introducing our girls to the world of science and technology is extremely important, since there is nothing in our world that isn't touched in some way by science and technology. Of course, since I am also a Guider, I also believe that it's important to have fun while trying out new experiences! These pages are a compilation of some of my favourite science and technology experiments. Most of these activities I've either tried out with members of Guiding or in my own elementary science classroom. 1. They must demonstrate a scientific principle or process. 2. They must use only materials which the average person can get a hold of - no fancy chemicals or equipment! 3. 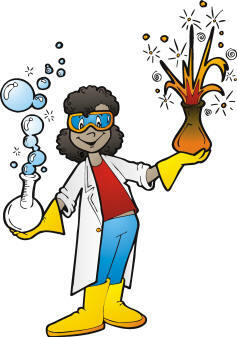 The experiment must be simple enough that a Guider who has no science background can explain what's going on to a Spark. 4. They must be fun! I would like to say a special thank-you to my friends Susan Lait, Wendy Baker, Cathy Calvert, Lynn Dziadszek, Shawn Bird, Tammy Waterhouse, Leslie Bown and Cat Onodera, who have all contributed to this section in one form or another. Enjoy!